The Bondtech BMG Extruder replacement uses an internal ratio of 3: 1 with precision-machined steel gears made of hardened CNC steel to provide the right power for all applications. Whether you need high-resolution printouts with small nozzles or high-flow printouts with large nozzles, the optimized transmission ratio combined with industry-leading drives provides unprecedented shifting power and quick retraction in a lightweight and compact package. The unique Dual-Drive technology ensures uninterrupted material flow without fear of grinding or slippage in even the most demanding conditions. Users confirm that even on prints with thousands of withdrawals, our extruders make flawless prints, with unmatched precision and zero damage or fiber degradation. Our BMG extruder handles all materials with high reliability, from slippery nylon and soft TPU / TPE fibers to highly rigid, and sometimes brittle, carbon-filled materials with high strength. The extruder is designed for 1.75 mm filaments, but has been tested to provide filament performance from 1.5 mm to 2.0 mm, which ensures high reliability regardless of the filament's tolerance. 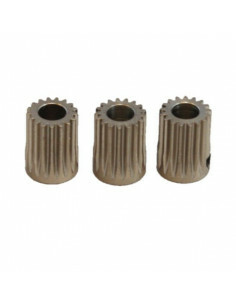 The filament path is fully guided in the extruder body, and the housing maintains narrow tolerances for the gears, reducing the chances of the filament breaking when using increased counterpressure or highly elastic fibers. The tensioner bolt allows the user to tune the pressure exerted by the drive wheels on the filament. It gives you the opportunity to match your preferences and optimize for the type of material used. To be able to change the material in the blink of an eye, just start the Quick-Release lever to release the tension and pull the material to be changed, from the extruder, keep it activated and put in a new material. This extruder can be used in Bowden or direct settings and gives you the flexibility to choose what best suits your application. In addition, it has an integrated method of stopping hotendów compatible with E3D-V6 hotenami or others using the GrooveMount standard. Fixing your hotend is simple, safe and without hesitation with just two screws. We have designed a standard mounting bracket, both in the CNC system and as a part for 3D printing, which can be downloaded free of charge from our STL archive. Our standard handle is CNC machined in 3 mm aluminum for maximum stability. Below is a list of available handles. The extruder fits any Nema17 stepper motor with a standard 5 mm shaft. To select the right stepper motors, choose one of the following or use your own motor. Heat-break hollow throat dedicated to BOWDEN type radiators with M7 treat, made of steel over the entire length. The Triangelab product. 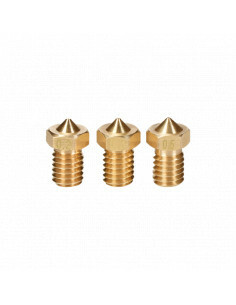 Nozzle for the E3D V6 type hot end: 0.8 mm 1.75 mm.